Much more fascinating than trying to predict what, on earth, is going to happen in global sourcing in 2009, is trying to make some sense of 2008's non-stop chain of events. However, emerging from the rubble has been the maturing of the BPO industry, as several global service providers have striven to consolidate their market positions, anticipating further growth in BPO services in 2009. The premise being that buyers are quickly becoming more accepting of radical change to their global business models that not only drives down operating costs, but also enhances their competitive position. How has BPO emerged as a vehicle to achieve these goals? BPO matured as buyers took on a bottom-up approach to adoption. For the first time, we have started to see BPO engagements being adopted in the right way. Rather than companies hurling their existing mess over the fence to a service provider (or politely dubbed "a transfer-transform strategy"), we've finally started seeing companies focus initially on transitioning the less-complex administrative processes, that can be supported by offshore/nearshore delivery and underpinned by tried-and-tested applications. HRO's comeback has typified how this should work, after 7 years of trying to be too clever, with most recent buyers making their initial forays into a global HRO engagement based on a global payroll delivery model, augmented with an HR systems implementation and supported by regional employee contact centers. This enables incremental HR processes, such as compensation, talent management and workforce management, to be integrated into the payroll hub, within a global model. F&A BPO services have already proven to be workable where buyers adopt the cash-cycle administration processes as an initial step, where offshore arbitrage is immediately available, and technology-enabled workflows can be plugged into the engagement. We are also beginning to see similar strategies with new procurement initiatives where firms are moving administrative support offshore, such as minor negotiations, supplier scorecard prep, market intel and data gathering, before taking on higher value work. The emergence of the Indian-headquartered providers as competitive global BPO options. The last year has borne witness to a host of global Indian-headquartered service providers continuing to move aggressively into the BPO industry. With the exception of Genpact, all the other Indian-headquartered providers in the BPO industry had previously developed considerable presence in global IT services, namely Cognizant, HCL, Infosys, Wipro, Satyam and TCS. They clearly view BPO as a natural extension to application services, that gives them deeper, more intimate client relationships, additional revenue opportunities, a differentiated solution and a much stronger client "lock-in" opportunity. Moreover, if they fail to develop a BPO story, they run the risk of slipping behind the competition. In fact, several firms entered into ITO engagements this year, where the future promise of expanding into BPO with that supplier proved to be compelling differentiator in the down-selection process. Their general approach has been to start with less-complex engagements where they build client trust and confidence through proving their worth and capability, as opposed to winning these "big bang bake-offs" with their illustrious US-headquartered competitors. The emergence of workable governance models has been a key ingredient. 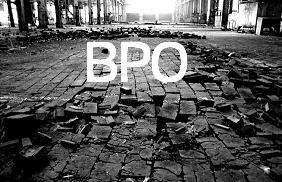 The major impediments to the success of past BPO engagements have been both the inexperience and resistance of buyers to develop a workable governance structure, in addition to the reactive nature of many suppliers to deliver services only to the letter of the contract. In many cases, companies have failed to restructure governance roles and responsibilities effectively, often creating a negative competitive dynamic with the service provider, and a resistance to change. Simply put, there is no defined curriculum for effective BPO governance; clients need to grasp control over their engagement and work pro-actively with their service partner - and vice-versa. The move towards a bottom-up approach to BPO is helping buyers experience managing their transactional work effectively in a global delivery environment, as opposed to finding fault with their provider providing higher-value services from the offset. Companies are looking to decrease IT and operations budgets, in addition to expensive business transformation projects. BPO offers a business transformational opportunity for firms, with the investment underpinned by cost-arbitrage and moving onto a global operating model. Moreover, many firms have implemented a new technology platform alongside a BPO initiative, with the incremental cost being absorbed over the course of the agreement. This new-look wave of BPO engagements, with the focus of deploying operational processes and technology as part of the initial scope, is going to provide real opportunities for companies in 2009, looking to find new levels of optimization at a global level. I can really appreciate your observations in this post. I'm currently helping a client launch a formerly internal business operation into the marketplace as a new BPO service. (They offer e-to-e revenue cycle solutions for healthcare providers.) As you suggest, we are finding the market very receptive to our services for cost and efficiency reasons, even though many prospects admit they are still wrestling with what the concept of business process outsourcing will ultimately mean to them. It is our belief most will eventually decide, as one CFO recently told us, "If it's transactional, centralize it. Then, if it's non-core, outsource it. It's that simple." Keep up the great work, it's helpful to have your perspective. Matt - thanks for the kind words. I have healthcare up there with retail and financial services as a major BPO hotbed waiting to happen, the only question mark being the extent of focus and pressure to reduce healthcare costs from the future Obama administration (esp, with all the other pressing issues). Moreover, there are several onshore providers in the sector which can drive substantial savings into the revenue cycle, simply by operating a centralized delivery model with high-quality operational performance. Culturally it's a struggle to get healthcare orgs to adopt outsourcing models, but we're seeing a lot more ITO recently, which should drive more focus on BPO opportunities. And while I buy the core/non-core debate, I believe more focus should be centered ultimately on what's "fit and ready" to outsource, and the impact of moving those processes over to a third-party. You're definitely in the right sector - good luck with the project! Precise insights here indeed. BPO should have taken off over a decade ago, but the lure of technology and the Internet in developing countries encouraged the rapid grown of offshore software development and IT support. Now that market is saturating, we are clearly seeing business services moving up the corporate agenda as businesses look for new ways of cutting costs and globalizing their business models. Great blog, those who don't learn from history will not thrive and possibly survive the future. This is true in life and BPO. I think the comments on ITO are right on track, still believe many listed above struggle to fully integrate and ITO/BPO offerings though. As companies focus more on governance in 2009, it will create better, more effective relationships between providers and clients. This will create more accountability on both sides and ultimately better performance. Ownership by the client is a key to success. Happy New Year to all and let's see what 2009 brings us in this industry we all love. Just by reading the title it gained my interest in reading the whole article. BPO companies have been emerging like mushrooms all over the world especially to those developed countries like India. BPO would really be a good business to keep up but interestingly hard if you doesn’t have the proper training and good management skills at your hand. In spite of global financial crisis, BPO companies stood still and remain optimistic that they’ll overcome this obstacle. Great post! And more power to you!